you are hearing the Eastern Towhee. And the younger grandkids found the Easter bunny at Great Grandpa's nursing home! 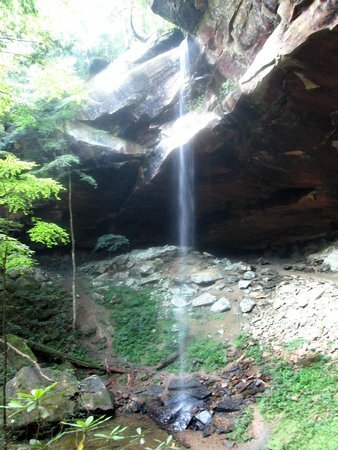 and hiked to Yahoo Falls. but of course, not the falls with the most waterflow. Next stop is Shakertown, an old Shaker community. And of course, there was an abundance of Shaker furniture. Next we stopped at the Four Roses Distillery, where they make Kentucky's famous bourbon. We took a tour of the facility and learned how they make bourbon. And got to taste the sour mash as well as the finished product. And, one of my favorite things about Kentucky is seeing the barn quilts on the barns. We had a fun getaway! With winter winding down, we are itching to get out and explore. I love the bluegrass state so we headed south to Kentucky. First stop was the Sanders Cafe, birthplace of KFC! Colonel Sanders' influence was all over the cafe. The kitchen had been recreated from the original cafe. And the restaurant still sells Kentucky fried chicken. Just 20 miles away is Cumberland Falls, known as the Niagara of the south. A neat phenomenen of the falls occurs every full moon with a clear sky. A moonbow can be seen in the mist of the falls in the moonlight. but this is a photo from the web that shows similar to what we saw. but the colors can be captured with long exposure photos. 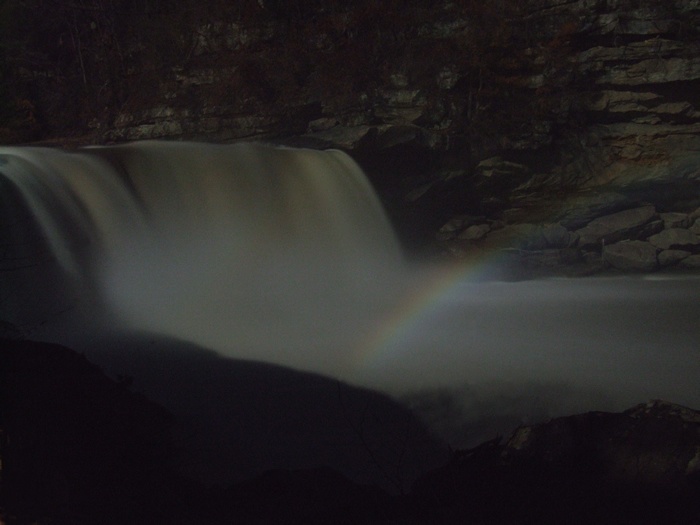 Moonbows are only seen at Cumberland Falls & at Victoria Falls in Africa. More scenes from Kentucky to Follow. The spring peepers are out! The harbinger of Spring is blooming after some warm wet days. We try to grab a horseback ride whenever the conditions allow. Today was a good day for a ride and we found something on our ride. A nice size shed antler. The temps are moderating and the winter is winding down. Time to make Maple syrup! First buckets & bags are hung on spigots in the trees. the sap moves up & down the tree trunk feeding the growing buds. The bags & buckets fill with the clear sap. We collect the sap and when we have enough, begin the boiling process. This batch we have 50 gallons, plus another 10 we collected after the boil started. The evaporator is fired up and boiling. About 1-1/2 gallons of syrup. Bottles from two different batches of sap. on the right, made in late February.